Prior to reading the sign below, posted in the parking lot of a local super-store, I could only image how many fully loaded carts were left standing at the cart return areas by the patrons of this establishment. In fact, if I had not looked up and read the sign I might have done just that. Thank goodness this company went out of their way to educate me, their slow and stupid customer, on this critical step in the process … empty the cart first before returning the cart. 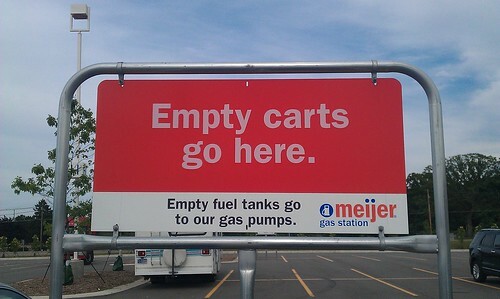 Imagine the full carts left in the lot before this sign was put up! Doubly perplexed were the gas station operators of this establishment. Having their customers show up with full gas tanks, only to top off the tank with a few pennies worth of gas, caused them to jump into action and ask for some verbiage on these educational signs for their dimwitted customers. Obviously, the educational campaign of letting people know that you go to a gas station to fill your car when the tank is near empty was a great public service to the community. Maybe I’m being to hard on the gas station operators. Possibly, this was simply a kind paternal attempt to avoid seeing their idiot customers in long lines of vehicles, with bone dry gas tanks, waiting to be filled at the empty cart return areas. I guess we’ll never really know. OK, I’m having some fun with a poorly worded sign. I had to get it out of me. After all, we are not talking about a street sign with missing punctuation for brevity being let loose on a unsuspecting neighborhood. The sign that comes to mind is “Slow Children Playing”. What a difference a little comma makes. This sign has often created an instant and deep sensation of pity towards the parents of these slow children, in which the city went out of their way to let everyone know that retarded children can found playing in the upcoming neighborhood. The words we use matter to some. I think we don’t spend enough time evaluating how our statements shape the opinions of others and assume that everyone has the same point of view or intention as we do. So what messages are we sending to our customers? Does your company have any phrases, tag lines, signs, etc., that could cause a customer to think they are ignorant and ill-informed persons, and would remain so if it weren’t for your existence on this planet? If you have any other examples, please share these examples with me in a comment below. These (word) pictures make for great presentation fodder when speaking in public engagements. I would love to hear from you.